Bring lively style to your outdoor edging using the Panacea Folding Fence with Frogs. This generous, folding fence brings a whimsical look to your yard, with its leaping frogs and green hue. A rounded top on each of the sections adds a delicate hint to the unit, and curved support rods add strength while mimicking flowers. Straight horizontal rods connect each section together, for a folding design with amazing versatility. The legs on the border easily install in soil, and the steel construction and green powder coating provide a weather resistant finish for years to come. 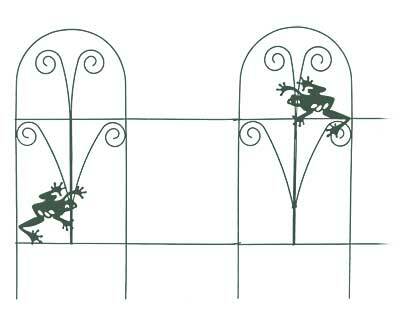 Add some whimsy to your garden by surrounding your plants with this Folding Fence with Frogs. Note: This case pack includes 10 of the Panacea Folding Fences with Frogs.